As I've mentioned in my last post I started up a new project during my trip to the Okanagan. I didn't have any intentions of starting anything new while away cause I was actually hoping to finish a few projects before the trip was over. Unfortunately, stupid me didn't pack the extra skeins of yarns for all my projects...which I needed. Hence why not much knitting took place during the trip. That is, until I decided to dive into my bags of new yarn after thumbing through my recently acquired Berroco Vintage & Vintage Chunky booklet and realized that I must knit up the Americano vest pattern. Like, now. So far it's been a fairly easy and fast knit. I've already got the back and one of the fronts finished (!!) 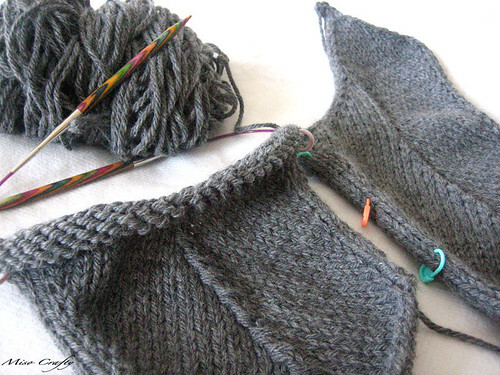 and am hoping to get all the knitting done before the weekend is over. Cross your fingers for me that this little goal will actually happen. 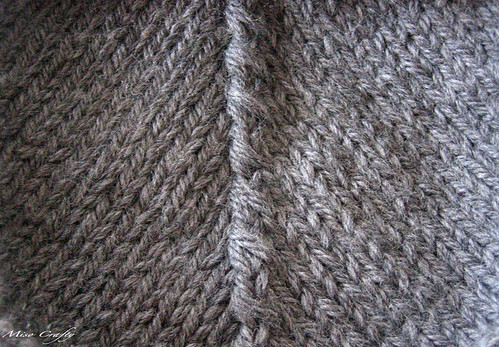 I'm using the called for yarn, which is Berroco Vintage Chunky, that I still have mixed feelings about. It's wonderfully soft, knits up great, but is somewhat a bit splitty. I think that has something to do with the fibre content, which is a mix of acrylic, wool, and nylon. That's right, I said acrylic. I think that's the part that I'm having mixed feelings about. I don't think I'm a yarn snob, but I do believe that if I'm going to spend all this time and money making myself a garment that I should enjoy and like the yarn I'm using. But as my friend Natalie said, it's not like I'm using the cheap acrylic stuff that feels like rope-y plastic that makes your hands sweat whenever you're knitting with it, but the stuff nice since it's Berroco that we're talking about here. She has a point. But I'll get back to you on that. The jury is still out on this one. Anyways, I'm loving the simplicity of the design details (as you can see above) but am not looking forward to having to sew all the pieces together. I'm hoping that since the seams aren't that long that it will be an easy job. I'm also hoping that the blocking process will also be somewhat easy, but I'm not so sure how the acrylic will fair since acrylic has no memory. I just hope that there's enough wool in the mix that my blocking attempts won't go to waste. I guess we'll just have to wait and see. 'Til then, I better get to it if I want this done before the weekend is over! Happy knitting!